We are a family owned business known for quality and expertise. Our goal is to help you find the best solution for outdoor comfort through rain, wind and sunshine. Learn why we offer the best retractable roof systems – request a consultation now. Do you have a deck, patio, or other outdoor space? Do you sometimes wish it was covered and sometimes like it uncovered? Control your environment with Rivera or Pergola Retractable Roofs! Mr. Cover All’s retractable pergola roof systems and horizontal shading provides optimal protection and, depending on design, are also available in a folded look. With perpendicular shading, you are perfectly protected from the sun, wind and prying eyes. Optional side and front glazing, which protects from wind and rain without dimming the view, are also available, so you can enjoy your terrace even in poor weather. The corrosion-resistant aluminium construction ensures rigidity and a motor installed as standard for ease of handling. The STOBAG PERGOLINO systems are retractable shading structures perfect when a lateral arm awning just won't work. With three models available, they can be mounted onto an existing structure, such as a pergola or over a skylight, or as a standalone product just mounted to a wall. Use multiple Pergola Systems to cover a large area. Thanks to the extended dimensions of the tried and tested terrace awning PERGOLINO, you can now provide decent shade over very large areas. Whether for a private party or a restaurant lounge, you and your guests are perfectly protected from the sun and rain. 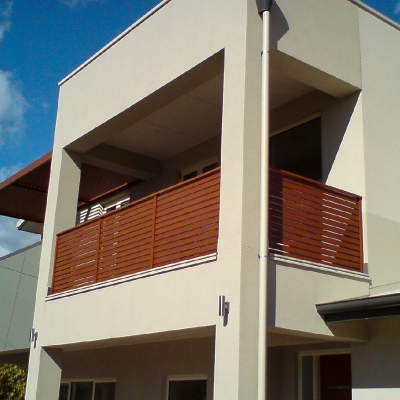 Side and front shading options can be assembled at a later date and increase the feeling of wellbeing on your terrace. A support profile underneath the guide rails provides the system with a high degree of stability. The PERGOLINO is thus able to withstand even high winds and weather. The robust system is assembled easily and quickly. Integrated gas-filled cylinders ensure the cover remains taut in any position. The powerful electric drive system ensures effortless use. The PERGOLINO P3500 is fitted with waterproof high tension fabric to give you the flexibility you need to enjoy your patio rain or shine. Available in a variety of colours and materials. Learn more: click here (PDF). 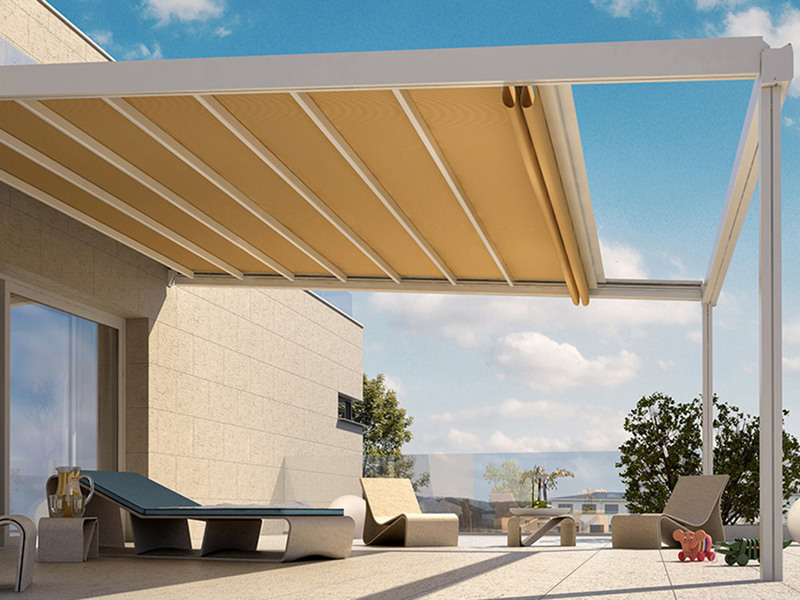 The STOBAG RIVERA is a new innovation in the old world of retractable awnings, designed to improve the quality and functionality of your outdoor space. With SOMFY® motorization and rain management features, this structure is constructed with Ferrari® Fabric combining the beauty of a pergola with the flexibility of a retractable awning. Combined with optional motorized exterior screens with clear vinyl windows, you can complete an enclosed functional outdoor space with unique features at a much lower cost than conventional construction. The RIVERA modular design provides for virtually unlimited sizes. A single fabric structure can span as much as 42′ wide by 26′ + projection. Combine modular units to accommodate any width imaginable. All models have the patented coextruded gasket to prevent water leak at the sides and offer wind resistance to class 3 +. The T-1 model retrofits to an existing structure. Its aluminum guide rails extend horizontally, supporting the fabric and keeping it tight when projected. The A-1 our entry level model; uses the same horizontal projecting guide rail technology and waterproof retractable fabric, but is supported by integrated front posts. The A2c is our most heavy duty model and considered the standard for commercial applications. The L-1 has the traditional appearance of a wooden pergola and is made of Norwegian Spruce. Click here (PDF) to learn more about the RIVERA retractable roof system. Get the control you’ve been looking for with the STOBAG TARGA and TARGA Plus retractable roof awning systems. Whether you have an existing structure you want to cover or just want more shade on your patio, the TARGA retractable roof series protects you from the sun and adds to the beauty and grandeur of your home and property. Learn more about TARGA and TARGA Plus (PDF) retractable roof awning systems.